The Daily Distress was published as a promotional gimmicky thing for The Essential DTWOF. My alma-mater, Oberlin College, has posted the coming-out story published in The Indelible Alison Bechdel Check it out here. In March 2007, scholars of Anglophone Studies in France presented three papers on Fun Home with delightfully academic titles. Here’s the Lollipop Magazine profile of my brother, the rockstar. In March of 2007, I wrote a short article for Slate Magazine about how it felt to tell my mother about writing Fun Home. Lookit! 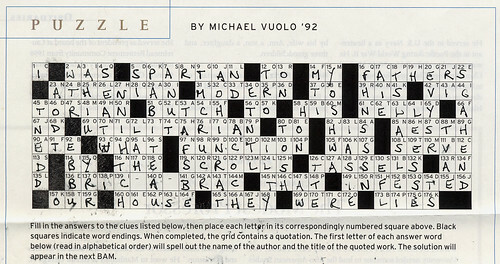 In the March/April 2007 issue of Brown Alumni Monthly, this quotation from Fun Home was the answer to the acrostic on the puzzle page. How thrilling to be part of the cultural background. Thanks to Bonnie Anderson for bringing it to my attention.